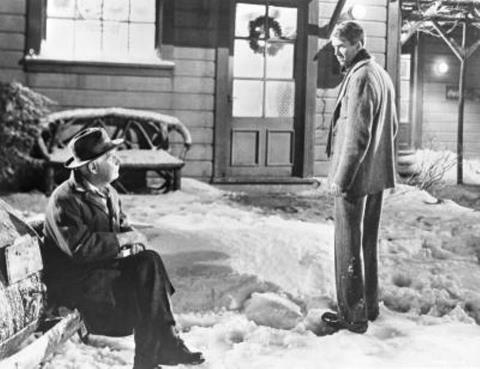 Many believe that Seneca Falls, New York, is the inspirational backdrop for Bedford Falls. That iconic movie is now celebrating its 68th anniversary. 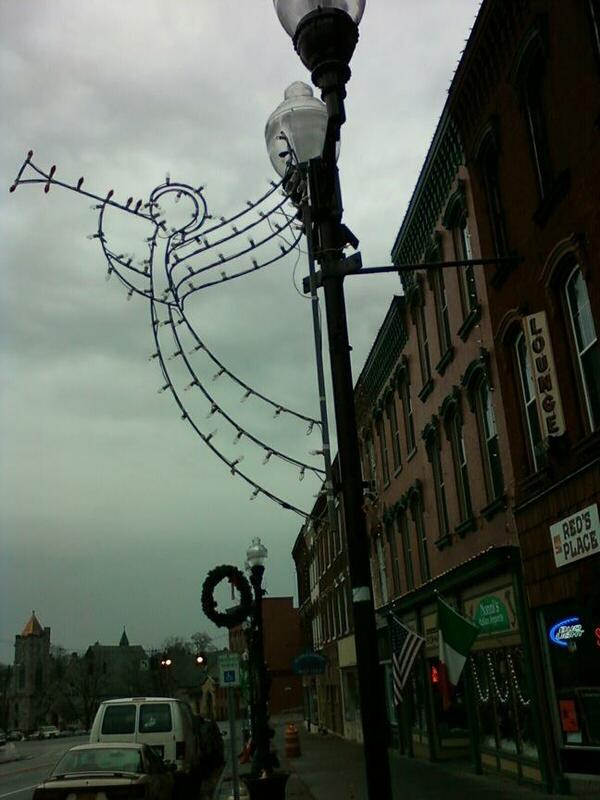 As I walked the streets of Seneca Falls with my family one Christmas evening, I was convinced it was as well. This story is an encore from December 17, 2011 because “It’s a Wonderful Life” is my favorite Christmas movie. What is your favorite holiday movie? I believe it was our Seneca Falls that inspired Capra’s Bedford Falls, too, Judy. What a wonderful post about “It’s a Wonderful Life.” That must have been a tingling Christmas Eve for you and Dave and the children, thinking about George Bailey and Clarence and Capra, too. Thanks for this holiday post. Karen and I watch this every year. Though you tag this as a re-blog, I didn’t know you back when you posted it first in 2011 – thank you. The message of the story/film is always fresh this season. And thanks for the link to my blog today. Thank you, Marian, for your many wonderful stories … and for nominating me for the Lovely Blog Award. i love this movie too, and i do believe you may have dropped into the right place. how lucky and what a wonderful feeling that must have been. I am about 10 blocks south of the huge Aventura Mall but with traffic takes 20 minutes to get there and nowhere to park. It has 11 million movie theaters and the place is packed with movie goers every Christmas Day. I never understood that. Why would people go to the movies on Christmas Day ? I watched one of my favorite movies, Planes, Trains, and Automobiles from a hospital bed last month. Christmas favorites are Christmas Vacation and It’s A Wonderful Life. I watched it a week ago on nbc and I watch it again tomorrow night on USA network. Seeing the bridge and anything I can from the movie has always been on my bucket list. Excellent post though, as always. My sons and I were extras in the stadium crowd scene of the movie “Little Big League,” back in the early 1990’s. We scanned all the crowd scenes (the ones that made the final film) for a sign of ourselves. My sons were certain they saw themselves, but it was such a quick glimpse that it’s hard to say for sure. The movie “Charade” was one of the reasons we went to Paris and stayed in the hotel where a part of it was shot. When I reposted the story, I chose not to reblog it because I wanted to add photos and a clip from the movie. I didn’t realize that the comments from the ‘old days would come along if you reblogged a post. I am glad you added the photos, Judy! They really add to the writing and post. The set for ‘Holiday Inn’ and ‘White Christmas’ is the same one, also I liked Danny Kaye in ‘Holiday Inn’ as an additional character. The plots are different but as I age, they get glommed together. 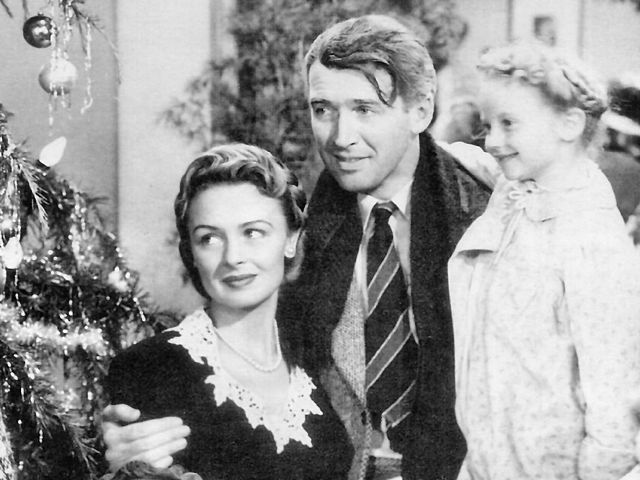 Judy, I will always love “It’s a Wonderful Life,” due to the great cast and story line. It was exciting to see that you were able to take your family to the possible (I believe real) site of the movie where it took place. It’s a wonderful post, Judy, no matter when you originally wrote it! Many thanks. And like us, too, Judy! I love these details, Judy! IT’S A WONDERFUL LIFE is my favorite Christmas movie. From it, we borrowed the “blessing” of giving wine, bread and salt to a family who moved into their new home, and for the longest time I rang the big bells on the wreath at the front door, announcing that an angel just got wings! Judy one of my all time favourite movies at christmas. Thanks for the reminder to watch it again real soon. Must have been fun to walk the streets and imagine the story unwinding there. Christmas wouldn’t be Christmas without…. Interesting to hear you’ve actually been to the place it was filmed. The newish schmaltzy film The Holiday was partly filmed in out little town which somehow makes it all the more real. Happy holidays, Judy! Jenny … Seneca Falls believes that it is the “inspiration” for Bedford Falls in the movie. If you go to the link above that I listed for the realbedfordfalls, you will see some of the coincidences that lead people to believe there is a strong connection. I love movies of that time . My daughters too they are in twenties of their age but they enjoy watching movies of thirtees and fourtees . Look to the real beauty of that time. Amazing . I never tire of the message in “It’s a Wonderful Life.” First of all, Jimmy Stewart. Over the years, he has become my favorite actor of that era, cemented when he read a poem he had written on the Tonight Show about the death of his dog. And then the magical, yet oh so human, story of the movie which leaves us all hoping that we’ve made an impact in this world and in our loved one’s lives. It wouldn’t be Christmas without this movie and thanks for posting, Judy. I have never seen this movie , even though , it’s on every year . I think it’s because I am a bit of a coward and steer clear of sad films . My husband , who is more of a ‘telly watcher’ than i am, watched it for the first time last year and didn’t ‘get it ‘. I remember thinking , I must watch that film, because my husband an myself share many interests, but have totally different choices when it comes to films. Sorry I bit late reading your blog I really liked it . Cherry … Your husband is not alone. My brother told me that our Dad, who passed 3 years ago, never liked this film. I joked that the sentimentality probably put him over the edge. I love the film and hope you will, too. It is a reminder that what is most important in life is family, friends and faith. There are sad parts but the ending is heartwarming. IAWL: just my favorite Christmas movie, and my favorite movie of all time, that’s all. And I’ve always been absurdly proud of the fact that I discovered it before it was, er, discovered. Talk about forgotten: it was the late, late show feature. While the movie was shot in California, I believe those Upstate New York references are a huge tip off that the author had some place in Central New York in mind. Seneca Falls believes its the inspiration for the film. I agree.